“What is true is hard to establish,” says one of several narrators, and this seems to especially refer to Color Plates—a collection of stories as abstract and varied as the paintings from which they spring. 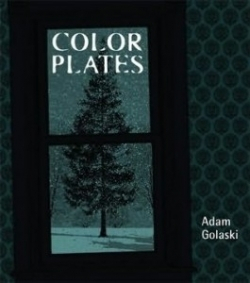 Adam Golaski uses work by Manet, Degas, Toulouse-Lautrec, and Mary Cassatt as starting points for his sixty-six “plates,” and colors his tales with an artistic blend of imagination and reality. A veritable gallery of stories that feel grounded one minute and ethereal the next, the book mimics the experience of walking through a museum and pondering the circumstances behind the art. This is Golaski’s second work of fiction; his first, the story collection Worse Than Myself, was published in 2008. The founder of Flim Forum Press, which publishes experimental poetry, he also edits a literary journal of experimental horror and science fiction called New Genre. Golaski’s interests in the indefinable, and even the unnerving, can be seen throughout Color Plates. Some stories are chilling, while others induce a contented sigh, but all point to a world beyond the page—strange though that world may be. Something is always left floating in the ether, just beyond one’s grasp. The same goes for his descriptions. In “On the Beach,” the narrator says, “Though the sun shone broad beams at me, I was as cold as I’d been when the woman had dissolved into the black ships, cold as the sky which was barely blue at all, as blue as ice sometimes is, as blue as pure white light.” More about feeling than comprehending, these stories focus on momentary sensations rather than categorizing experiences into neat and tidy lines. The narrator of “Head of a Young Woman” says, “Her mouth. Her eyes. When I look long enough, I see the great bruise undercoat.” While one may not be able to articulate precisely what this means, the image is stunning—and unmistakable. In “The Boating Party,” a mother says to her daughter, “Don’t forget that most stories start before you know they have.” The tales in Color Plates are like this—snapshots of sorts, and each one takes on a life of its own. But together they form a pastiche, a kaleidoscope of worlds fused into a beautiful whole. A narrator says in the epilogue, “The book is a story, but hidden inside that story are other stories, and these are the stories that matter to her, stories unworried about why the gold gears of their clockwork mesh. Let them mesh lovely, she thinks.” And in this shimmering collection, mesh lovely they do.